Members of the Yuma Fire Department compete in the hose cart. Join us for the 2019 2nd Annual IAFF -United Yuma Fire Fighters Fire Muster on 5/4/2019. All proceeds from this event are used to help local firefighters and their families when in need. 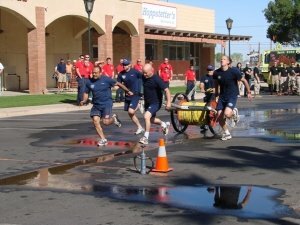 Membership Services is a subdivision of the United Yuma Firefighters Charity. Please click the link below for a set of the rules. Complete the following form to register a team. All teams are required to bring 4 (50ft) sections of hose (200ft total). Teams are made up of 6 Members. Please fill out all of the information and submit the form. Teams are allowed to have more than 5 players, however, only 5 players may be on the field of play per event. Substitutions are the sole responsibility of the team captain. This person will serve as the team captain and point of contact for all official notification. 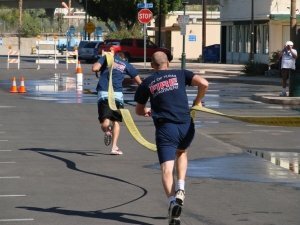 Join us for the United Yuma Fire Fighters Membership Services 2nd Annual Fire Muster. If you’re interested in competing with a team please see the link above to register your team.